SEOUL, South Korea, Oct. 19, 2018 /PRNewswire/ — EONE-DIAGNOMICS Genome Center (EDGC), a global company in genetic analysis, has announced the release of a liquid biopsy screening service this autumn. The service is a non-invasive liquid biopsy technology which has drawn attention as the most promising advanced diagnosis technology with the development of NGS technology. Ph.D. 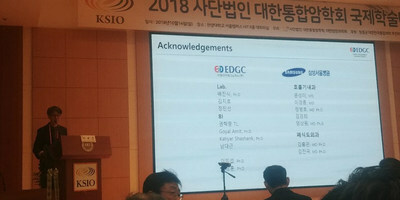 Sung Hoon Lee proceeded a presentation at the International Symposium of KSIO. The liquid biopsy technology is a technology that Grail, Illumina Inc. spin-out, and others have raised about 1.8 billion dollars’ funds to develop it. It is useful for preventing any recurrence in patients with cancer and early detection of cancer. The liquid biopsy screening technology is known as the most advanced liquid biopsy technology that is able to early detect various cancers with a simple blood test from people without any signs or symptoms, and it is only capable through comprehensive analysis of samples, various biomarkers measurements and precise algorithms. EDGC has been developing the liquid biopsy technology for lung cancer, colorectal cancer and breast cancer, interworking with domestic and overseas university hospitals and has decided to commercialize it as the recent clinical experiments have excellent achievements. The liquid biopsy screening service commercialized this time would be provided to the global market through CLIA certification in the United States. Also, it would predict risk of cancers statistically and detect even microscopic factors leading to cancers, analyzing both inherent risk of cancers and acquired biomarkers simultaneously. In these regards, EDGC has presented ‘NGS Analysis Methods and Examples for Liquid Biopsy’ at the International Symposium of Korean Society of Integrative Oncology which was held in South Korea on October 14th. The symposium covered the topic of anti-cancer immunotherapy; the Nobel Prize-winning field. In the symposium, greatest scholars such as Dr. Gary Deng of the Memorial Sloan Kettering Cancer Center in the United States and Prof. Ping-Ping Li of Peking University Cancer Hospital in China participated and discussed integrated cancer treatments. Therefore, it became a valuable opportunity for EDGC to show its liquid biopsy technology. Ph.D. Sung Hoon Lee, a chief technology officer in charge of the development for the liquid biopsy screening technology, said that the multi-omics liquid biopsy method is an innovative method to overcome constraints and limitations of existing cancer diagnosis tests by combining protein and nucleotide sequencing analysis and performing quantitative and qualitative analysis simultaneously. He explained that it is able to provide the multi-faceted service by accumulated experiences of genomic data analysis algorithms and non-invasive prenatal diagnosis that EDGC has developed so far. Meanwhile, Variable Signal-Amplifying Algorithm (VarSAMP), a core algorithm of the technology, and Multivariant Regression are patent-pending, and other quantitative and qualitative analysis methods and complex analysis are in preparations for patents. Also, Lee said that the method could not only detect cancers with high accuracy but also allow accurate measurement with a little data since it maximizes sensitivity but does not lower specificity. Therefore, it has an advantage to perform accurate analysis with a much lower cost as compared to methods used by overseas competitors. He expressed high confidence about it. After announcing the technological development, EDGC plans to perform global research and additional clinical cooperation in several countries. For this, it will recruit clinical participants from South Korea, the United States, China and so on. With this clinical participation, EDGC will promote a campaign to prepare for a healthy 100-year-old age through early detection of cancers and apprehension of comprehensive risk.